Note: For simplicity, this guide assumes you already understand how to list a product on eBay using SureDone. If you need a refresher, take a look at our guides on How To: Add a Product & How To: Edit an eBay Listing. 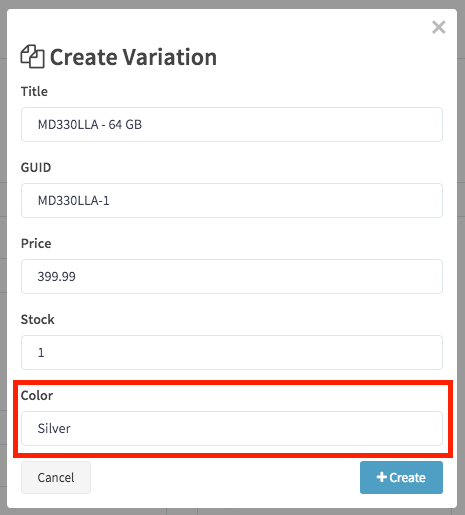 A variation is an attribute that changes from one version of a product to another (such as color or size) – variation listings allow sellers to offer all of those different options as a single product with variation options within the listing. This helps keep your store organized and creates a more professional feeling experience for your customers. SureDone accomplishes this by listing the original product (or “Parent”) and then creating a variation or variations based off that (“Child” or "Children"). There will be a list of the variation fields that have already been mapped. Note: You must include a value in the field(s) you plan to vary on in the parent item (i.e., if you are varying color then you must assign one of those colors to the parent). If a field is left blank in the parent, you will not be able to vary that value for the children. 5. The Create Variation modal will pop up. Filling out this information will create the first child of the parent product you created in step 3 when you clicked "Create Draft". 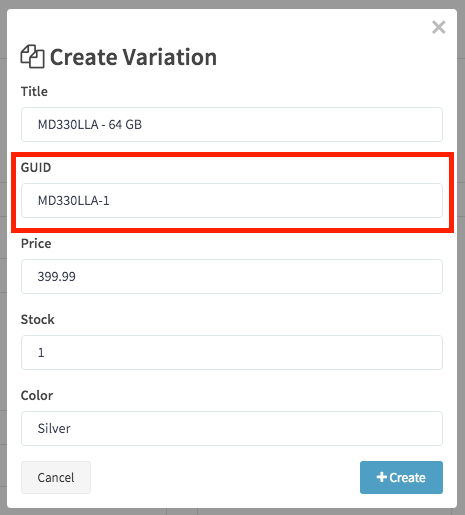 When you create this item, the SKU will remain the same, but the Global Unique ID (guid) must be changed to indicate that the item is a child. In this example, the guid has had a 1 appended to it. This is important. The SKU must be the same (this is how the child is associated with the parent) but the Unique ID must be completely unique. 6. While you're in the Create Variation modal, you can change the variable information (e.g., the Color field). 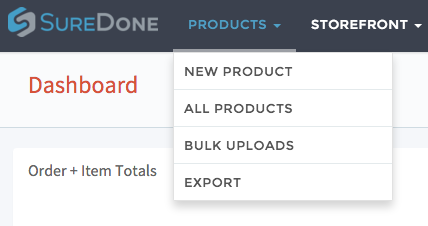 When you click the "Create" button, the new child will be created with all of the information you have entered in the modal, and all of the information from the parent (that wasn't present in the modal). Note: The only fields that you can vary are those set up in your variations settings (see the first part of this guide), the price, the stock, and the image. Any other information will not be variable (the listing will use only the information from the parent – even if you change their value). 7-A. In the Media section, paste an image URL in the URL field and click the "+ Add Image" button, or click on “Choose Files” to upload an image from your hard drive. 7-B. Special note for images, if you are going to vary the picture, make sure that image matches with all other images of the same variation. (i.e. if you are going to list a dress that come in red, black, and blue each in S, M, L; then make sure you use the same image for each of the red dresses). The best way to achieve this is to create all the variations that go with a single image at once (i.e. create the S “red” dress variation, then the M “red” dress variation, then the L “red” dress variation, then and only then move onto the black dresses – this way you only have to change the photo once). 8. Press the “Update” button at the bottom of the page, this will save the added image to the variation in SureDone. 10. 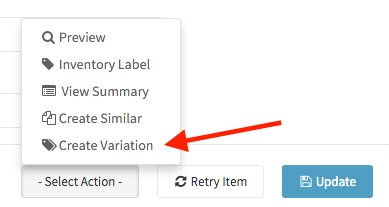 Once all of the variation children are made, go to the parent listing by opening the Variations modal (click the "Show Variations" link at the top of the General section). 10-A. Once the Variations modal has opened, click on the link to the parent inside the modal. 11. 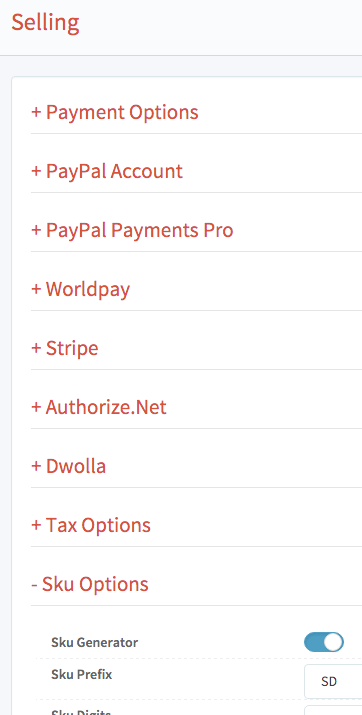 Once ALL of your variations have been created, go to the parent and make sure the channels you want to list to are checked in the "List on" section. 11-B. 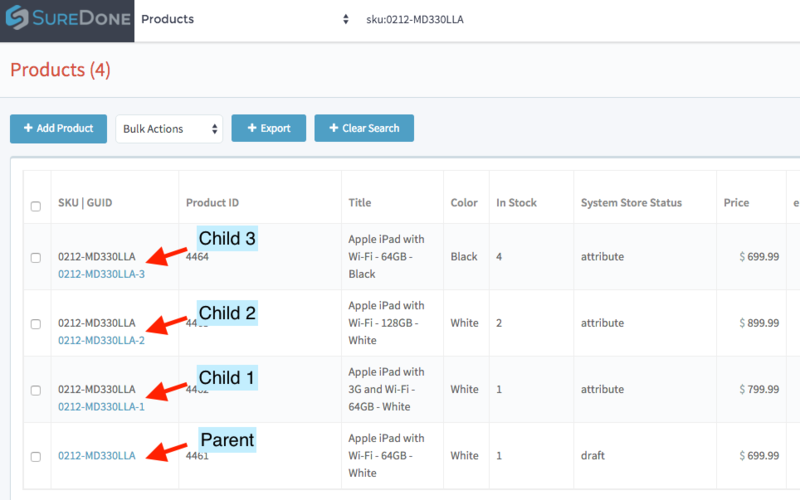 If you come back and want to activate the listing at a later time, you can always identify the parent by typing in sku:######## into the editor (where ####### is your item’s SKU). The listing without a separate Unique ID will be the parent. Note: eBay has a hard time syncing new variations after the initial listing, so it is very important that you have all your variations created and filled out before listing to that channel.